Anelletti on the left and mini penne to the right. 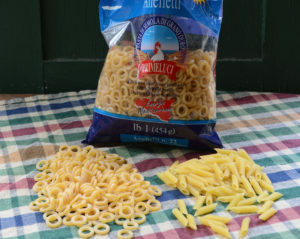 Anelletti is a regional pasta shaped like little rings (anelli in Italian) that is popular in Sicily. 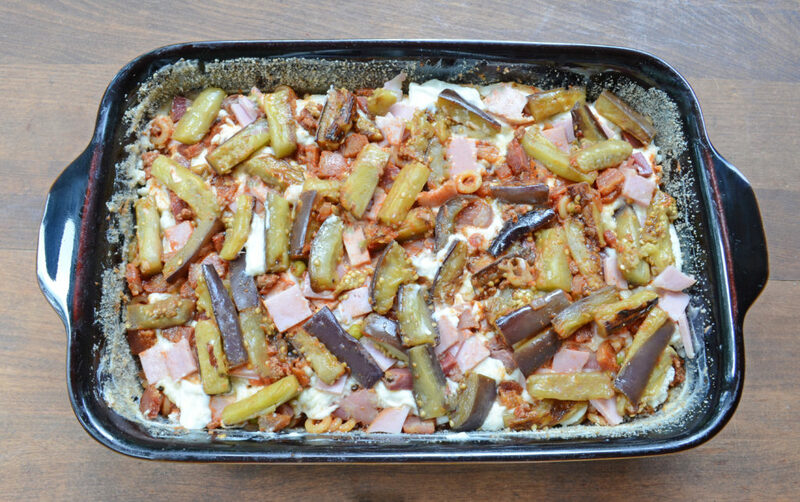 Anelletti al Forno (Baked Anelletti) is an awesome baked pasta dish layered with ham, pancetta, sautéed eggplant, grated cheese and mozzarella and made using two different sauces – a red (tomato based) meat sauce (ragu) and a white sauce (salsa beshiamella or béchamel). Each mouthful is a profusion of flavors. This version of the dish is typical of that made in Palermo. As usual, there are many variations. I sometimes add tiny meatballs, which reminds me of Spaghetti O’s. Perish the thought – it makes me wonder if Chef Boyardee was Sicilian. 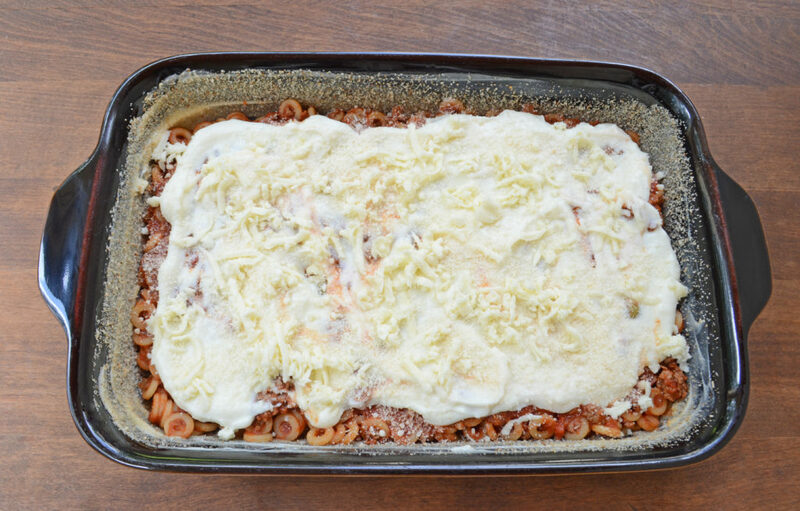 The process for assembling this pasta dish is similar to making baked ziti, lasagna, or timballo. Anelletti pasta can be difficult to find. As a matter of fact, I purchase mine by mail order. There are many Italian grocery stores that do carry it. If you have trouble finding anelleti you can substitute mini penne or other similar small pasta. Just a note – my recipe deviates a little from the traditional method of layering the pasta. 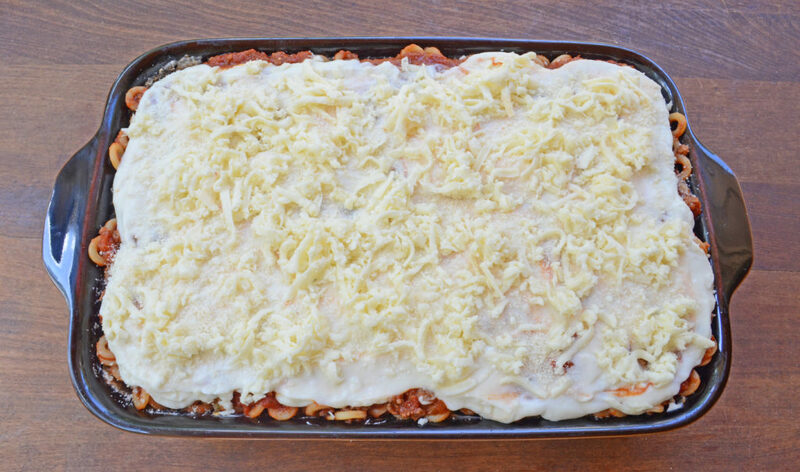 After placing the first layer of pasta in the baking dish, you would normally smooth and combine both sauces together. 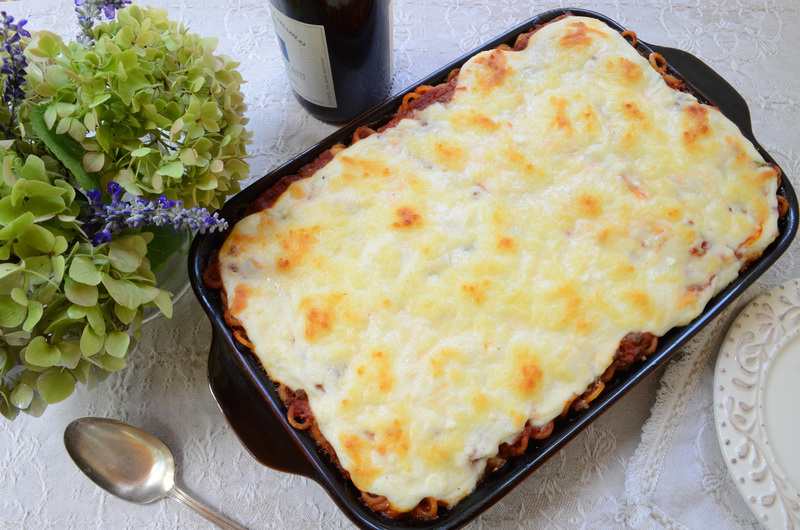 I prefer to layer the white sauce on top without mixing, like putting a layer of ricotta on lasagna. The final layer of white sauce on top becomes bubbly and lightly browned. MAKE THE MEAT SAUCE: Heat olive oil in a 6-quart covered stock pot over medium heat. Add onion and cook until soft and translucent, about 6 minutes. Raise heat to medium-high, add ground beef and cook until browned. Stir in tomato paste and cook for 1 minute. Add tomato puree, 1 cup of water, garlic, and basil. Cover and bring to a boil. Reduce heat and simmer 15 minutes, stirring occasionally. Add more water if necessary for desired consistency. Stir in peas and sugar. Season with salt and pepper to taste. Cook an additional 15 minutes. The sauce can be made a day ahead of time. Reheat and thin with a little water before using. COOK THE EGGPLANT: Heat 1/4 cup olive oil in a large frying pan, over medium-high heat. Season with salt and pepper. Add eggplant and sauté until lightly browned and tender, about 6 minutes. Remove eggplant and place in a small bowl. Add pancetta to the frying pan and cook until lightly browned, about 5 minutes. MAKE THE WHITE SAUCE: Melt the butter in a large saucepan over low heat. Stir in flour. Mixture will start to bubble; continue to cook 1 to 2 minutes longer. Do not allow the mixture to brown. Using a whisk, gradually add milk stirring until smooth. Add nutmeg and season with salt and pepper. Adjust heat to medium-low and continue stirring until mixture begins to boil, about 4 minutes. Continue cooking for approximately 4 minutes longer, until mixture has a medium-thick consistency. Place a piece of parchment paper directly on top or rub a cold pat of butter along the top to prevent a skin from forming. COOK THE PASTA: Bring a large pot of salted water to a boil. Add pasta and cook until al dente. Drain pasta, transfer to a large bowl and toss with half of the meat sauce. 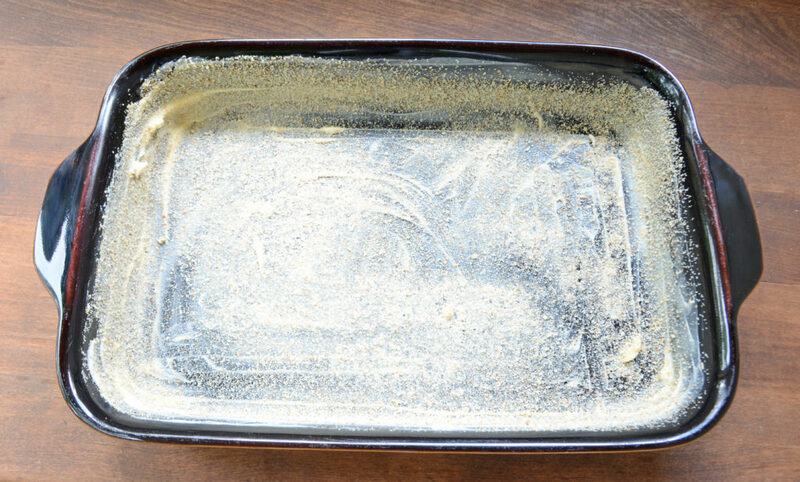 ASSEMBLE THE ANELLETTI: Preheat oven 350 degrees F.
Grease a 9-inch by 13-inch baking dish with the 2 tablespoons butter. Coat evenly with bread crumbs. Place half of the anelletti on the bottom of the baking dish. Smooth out into an even layer with a spatula and gently pack pasta down. Add half of the remaining meat sauce on top in an even layer. Spoon half of the white sauce on top and spread out in an even layer. Sprinkle with half of the Pecorino, then half of the mozzarella. 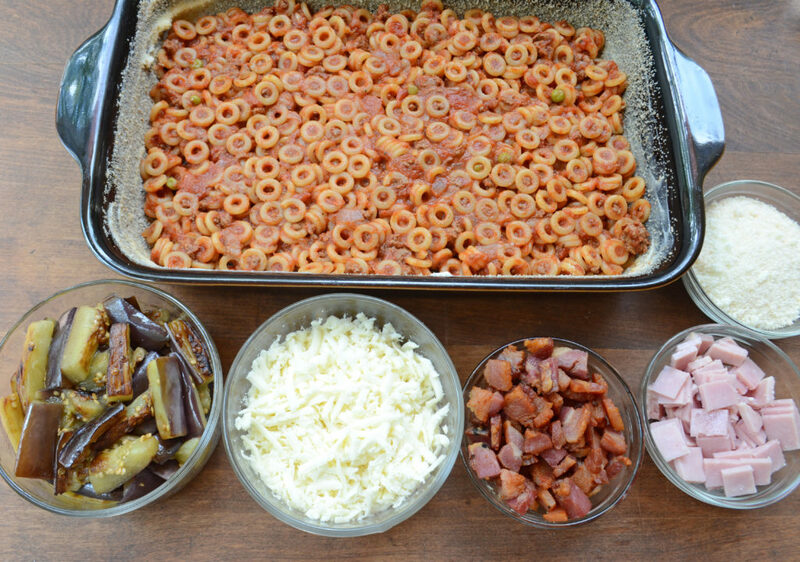 Scatter the pancetta, ham, and eggplant in an even layer along the top. 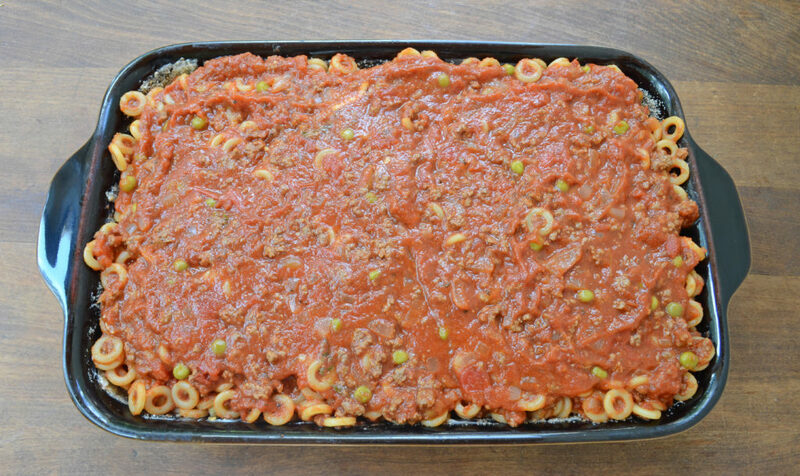 Layer the remaining pasta on top, followed by the remaining meat sauce. Spoon the remaining white sauce on top and spread out evenly. Sprinkle with remaining Pecorino and top with mozzarella. Bake for approximately 35 minutes, till top is lightly browned and bubbly.